All Full & Half Marathon finishers will receive unique woodalions. Winners will get additional prizes! Awards and prizes will be given to the top overall five male and female finishers. Awards will be given to the top three male and female finishers in the following age groups: 16-19, 20-24, 25-29, 30-34, 35-39, 40-44, 45-49, 50-54, 55-59, 60-64, 65-69, 70-74, 75+ and Master’s category. Awards and prizes for top local male and female finishers from Buncombe, Haywood, Henderson, Madison or Transylvania Counties. All Asheville Marathon finishers will receive a custom designed woodalion and a cozy one-of-a-kind, Asheville Marathon blanket as you cross the finish line. Winners will receive custom-crafted glass awards and special prize swag from our sponsors and race partners. All Asheville Half Marathon Finishers will receive custom Asheville Marathon & Half pint glasses and a custom designed woodalion as you cross the finish line. 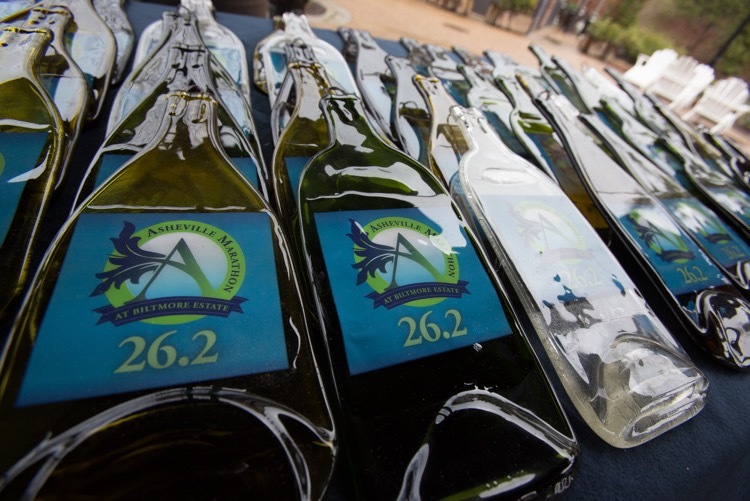 Winners will receive custom-crafted, locally-made glass awards and special prize swag from our race partners and sponsors.